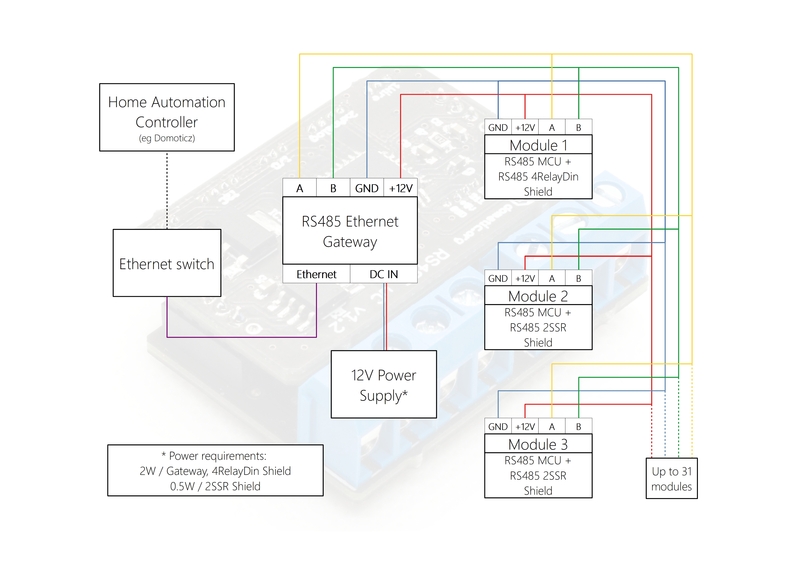 We are happy to introduce our RS485 MCU Module, a basis of our RS485 system. It is a small board, compatible with Arduino and ready for RS485 wired communication. It was created as a result of our experience with DIY home automation systems, therefore it benefits from lots of our observations and is designed to be convenient to use and install. The most important feature is although its versality - we designed it with having an idea in mind to make it compatible with various shields and wired extensions, which are meant to extend its functionality. A compatible 2 channel AC shield is already finished, but we plan to prepare many other shields such as dimmers, DIN mountable relays, heating modules, sensor extenions and others. Very small size of 39x25 mm. Multipurpose I/O 2 - D2, D3, GND. Every shield that will ever appear will be listed here. An efficient way to understand what our idea is about. If you have ever wondered how to put all this modules togother, this picture is for you. 10-pin IDC female connector, like this one. You have to fix the wire and the IDC connector together on your own. It is not too difficult, but be careful of mistakes. When you have the MCU connected to programmer as it is shown on a picture, you can now use your PC's USB port to flash software. 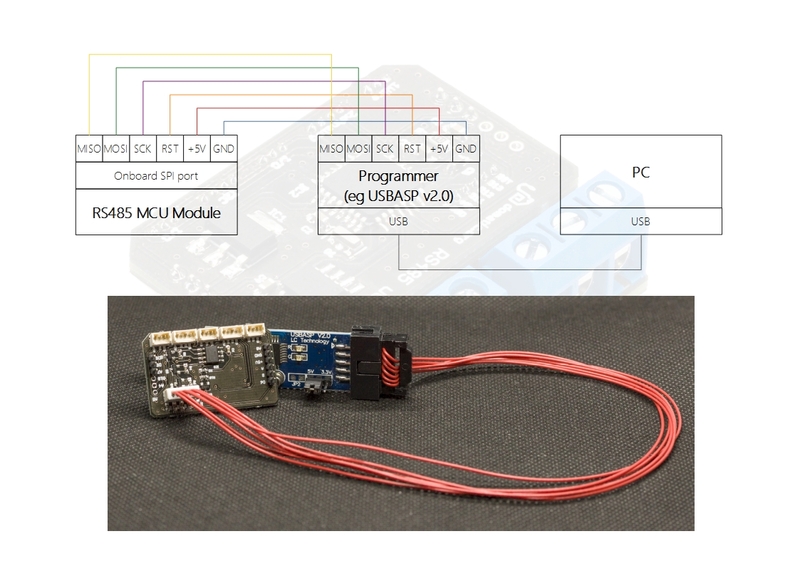 If you are using Arduino IDE set Tools -> Programmer -> USBasp. Then Sketch -> Upload Using Programmer. That is it! 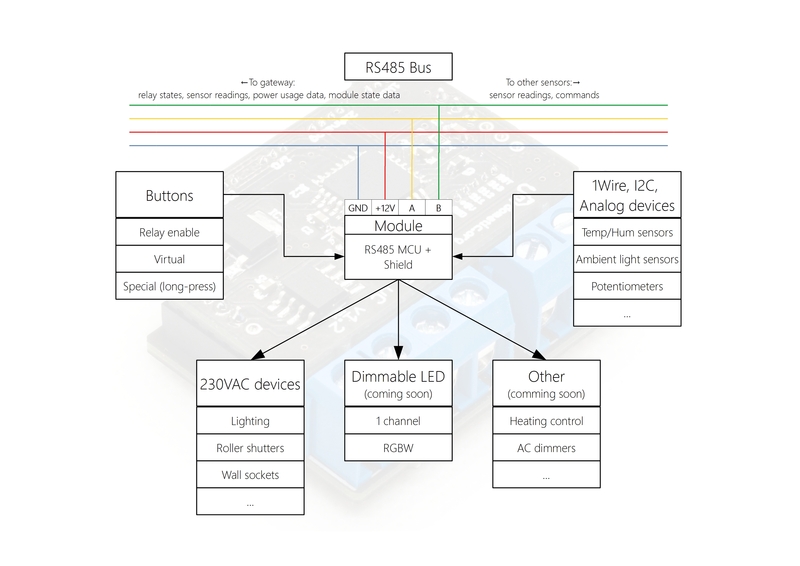 Q: How to connect this module to Domoticz (or any other controller)? A: Our RS485 Ethernet Gateway will be available soon. Before that please use MySensors RS485 Gateway. For details see wiring instructions above. Q: How to upload software on this board (especially if there is no usb port on board!)? A: Instructions above (Instructions -> Connecting to PC). A: Firmware Over The Wire, it is a method of uploading code through RS485 bus, without any need of removing modules from the wall. It is still an experimental feature and sometimes does not work well, but the MCU module is ready for it anyway. Q: What kind of assembly is being offered? A: Manufacturer provides complete SMD and THT assembly. No need of looking at soldering iron after purchase. A: Because of small quantities being produced. Growing interest will hopefully let the manufacturer lower the price.